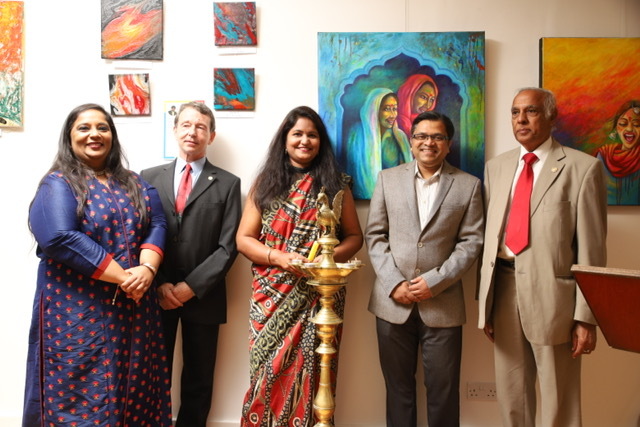 International painting exhibition by the Art Elements group, curated by Dr. Supriya Dudhal, was inaugurated on Saturday, 25th August at Bhartiya Vidya Bhavan. One of the key highlight was celebration of 70th birthday of NHS with the cake cutting by Dr. Subodh Kamble, renowned robotics surgeon. Exhibition was inaugurated by Chairperson Bharulata Patel-Kamble, first woman in the world to drive solo through 32 countries in only 57 days, recipient of national honour by the Hon. President of India; Chief Guest John Carrigan, renowned British actor and martial artist, recipient of multiple fighting spirit awards; Special Guest Ramesh Srivastava Ex-Mayor for Rubgy; Satya Minhas, Chairman for Metropolitan Police Hindu Association; Varsha Mistry, Metropolitan Police Forensic department and Ranjula Madani, honoured by Queen Elizebeth. Dr. Supriya Dudhal, who has been in Limca Book of Records and India Book of Records, had successful solo exhibition in the end of May 2018 at The Nehru Centre, London, and then solo exhibition in June 2018 in France. She then decided to do a group show for artists across different cultures and different countries, to give them opportunity and platform to showcase talents so they can get wider recognition at international level. In all 18 Artist participated across world out of which 9 artists from London, 8 artists from different parts of India and 1 artist from Malaysia. Exhibition was open to all people for exploring art and interacting with artists for all 3 days. It also included workshops and poster competitions and winners were awarded by great painter Sunita Khedekar, a senior artist from London, UK.